The Hope Mountain Barter Faire is a 3-day celebration of culture and creative energies. The faire features unique entertainment, trading, live music, and great food. This is a family-friendly event. All are invited to attend as long as you are respectful, responsible, cooperative and nonviolent. Let’s keep this event safe and nurturing for our children. A few notes and reminders for Lake Selmac County Park: Be prepared for cold nights… Bring tie-downs or weights for windy conditions… There is a disc golf course on-site… There are a limited number of camping sites in the trees for $100 (on top of admission prices) on a first come first served basis. Also, a special note for all Food Vendors (and others): With our move and new logistics, we will not have a dishwashing station this year. Food vendors and attendees should bring paper plates. Please no styrofoam or throwaway plastic dishes. Sorry for the inconvenience, everyone. 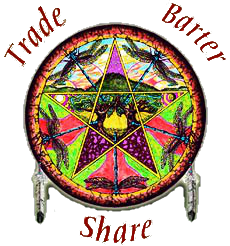 The Hope Mountain Barter Faire began in 2003 as a way to support the programs and people of the Dome School. Today the faire is sponsored by YES! (Youth Empowerment & Support), a non-profit organization created to continue this mission of support for the Dome School’s programs. 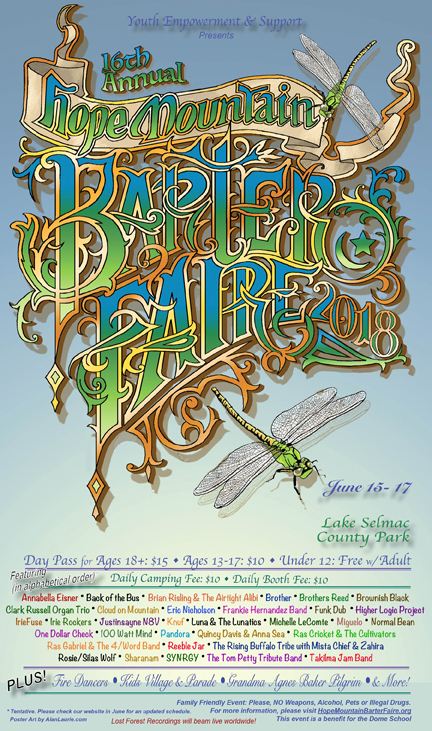 Take a look around this website to learn more about the faire, but note well: numerous volunteer opportunities are available, which can provide you free admission!